Posted on Thu, Feb 9, 2012 : 1 p.m.
Ann Arbor's Cara Rosaen speaks about using crowd-sourcing to document our food system at a TEDx event in Manhattan. Cara Rosaen, co-founder of Ann Arbor's Real Time Farms, was recently in Manhattan for a TEDx talk on using crowd-sourcing to document America's food system. 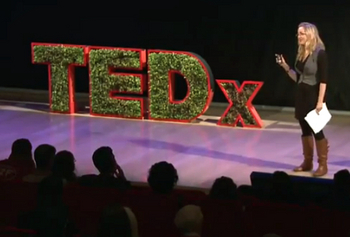 The theme of the TEDx event was "Changing the Way We Eat." Rosaen spoke to attendees at the Times Center in New York City, and her presentation was broadcast to thousands of viewers online and at TEDx viewing parties. TED (Technology, Entertainment, Design) is a nonprofit organization devoted to spreading ideas through conversation. TED has two annual conferences and regional, independently-organized events. Real Time Farms is a crowd-sourced online food guide based in Ann Arbor.